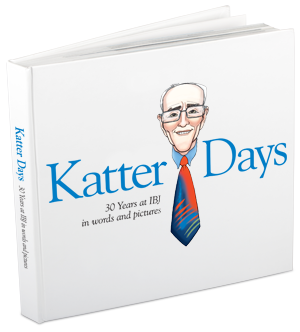 Chris Katterjohn arrived at Indianapolis Business Journal in 1980—before the first issue hit the newsstands—with little newspaper experience and zero idea what he was getting himself into. He couldn’t have known that the little experiment of a newspaper he was joining would evolve into IBJ Media—a collection of small but mighty media properties known far and wide for their quality, profitability and influence. Chris, meanwhile, grew from a jack-of-all-trades managing editor into an editor before spending 20 years as our president and publisher. His unique brand of humor, friendship and caring—his “whistle while you work” style—set the tone for our success. The photos and tributes in this book are meant to convey what Chris has meant to all of us.